"Trophy of a lake refers to the rate at which organic matter is supplied by or to the lake per unit time." Trophy, then, is an expression of the combined effects of organic matter to the lake. As developed originally and as largely used today, the trophic concept (e.g., TP, Cha, SD, and TN) refers to the pelagic-zone-planktonic portion of the lake ecosystem (cf. Tables 4.1 and 4.2, CCME & EC, 2004). The littoral flora and its often dominating supply of autochthonous organic matter to the system, was, and usually still is, ignored. Prof. Dr. Bob Wetzel was a recipient of numerous awards in limnology, biology, and ecology among which were the Naumann-Thienemann Medal, the top medal in limnology, and the Hutchinson Award. 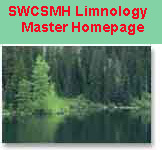 Trophic State Classification of Lakes with Aquatic Macrophytes (Canfield et al., 1983), and Assessing the Trophic Status of Lakes with Aquatic Macrophytes (Canfield and Jones, 1984):- "Conventional criteria for classifying trophic state emphasize conditions in the open water and ignore the nutrients, plant biomass, and production associated with macrophytes. 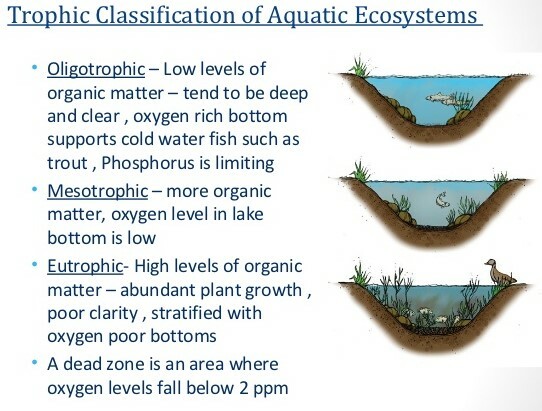 A potential water column nutrient concentration can be determined through adding the nutrients contained in macrophytes to those in the water. Potential nutrient concentrations can be used in existing indices to classify lake trophic status." The Corvallis LEI (Lake Evaluation Index)-composite trophic state index that includes Total Phosphorus (TP), Total Nitrogen (TN), Chlorophylla (Cha), Secchi Disk (SD), macrophyte coverage, and dissolved oxygen values in lakes. Vollenweider's dictum re the OECD Probability Distribution Diagrams: Notwithstanding the trophic state classifications based on pelagic parameters, listen to a 4-minute mp3 sound file of Dr. Richard Vollenweider promoting the use of the OECD probability distribution diagrams in order to establish trophic states with a high confidence level. Dr. Richard Vollenweider was a recipient of the top medal in limnology, the Naumann-Thienemann Medal, among several other awards.